Here’s wishing everyone a healthy, peaceful and very Happy New Year 2014!! We generally have a variety of dry curries or ‘karamadhu’ with rice for lunch. 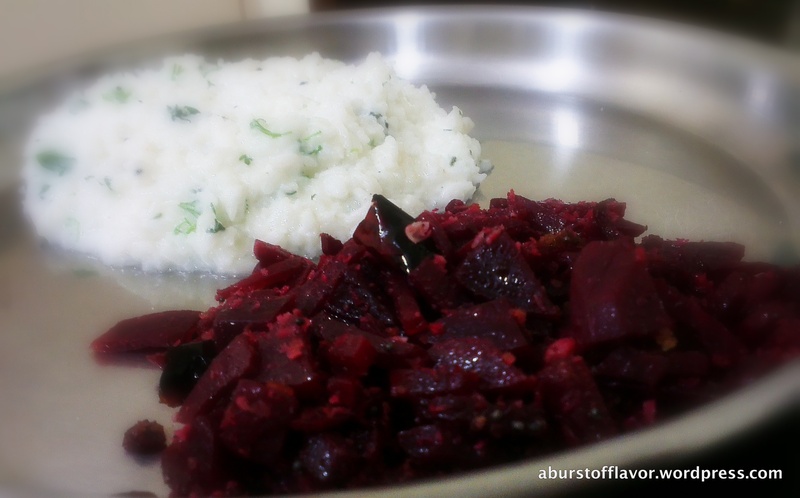 This dry beetroot curry especially is a cracking pairing with curd rice, and gets polished off in minutes at my place 🙂 The addition of coconut makes this dish even yummier paired with the mild sweetness of beets. Read on for the recipe! Rinse the beets well in running water. 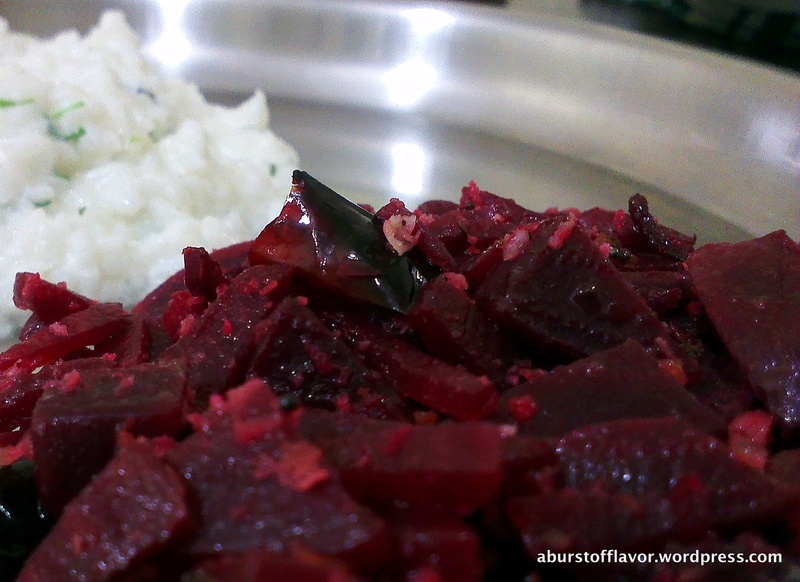 Pressure cook the beetroots for 4-5 whistles. Let the pressure dissipate. Check if the beetroots are tender. The skin of the beetroot should come away easily now. Peel off the skins and cut off the edges. Now chop up the beetroot into cubes or sticks, however you prefer. Heat oil in a wide bottomed pan. Once oil is hot, add black mustard seeds and allow them to splutter. Add curry leaves and let them crackle. Add red chillies and asafoetida immediately after. 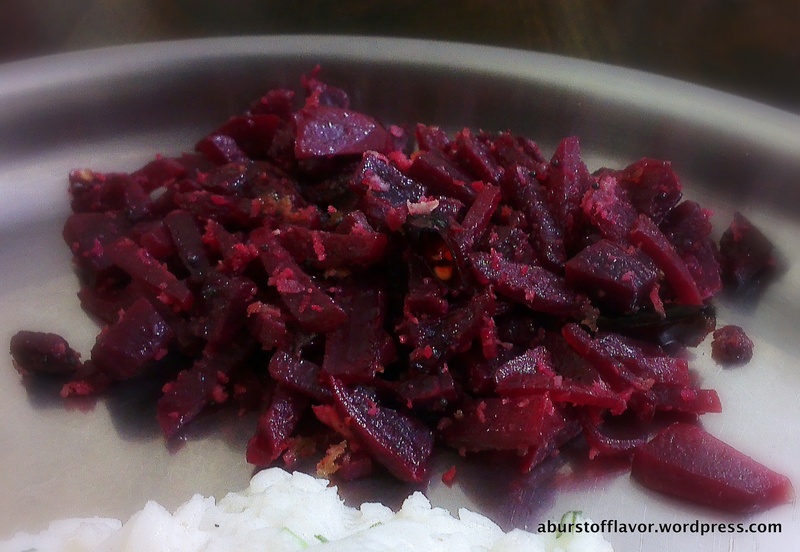 Add the chopped beetroot and fry for a minute. Add the sambar powder, salt, sugar and fry well for about a minute or two. Switch off the stove. Immediately add freshly grated coconut and mix well. This tastes fantastic with Sambar Rice, Rasam Rice, Curd Rice and even Chapathis. Try it !